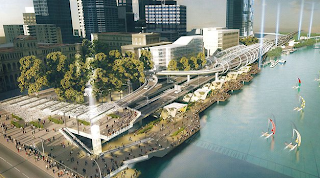 Campbell Newman is proposing new plans for the North Bank area of the Brisbane River, including George Street. It seems like the hotel and casino proposal for the old State Library site has been put on ice by the new government. See stories on Brisbane Development and Brisbane Times.